We can assist with the acoustic design of both new build and converted dwellings so that the building should comfortably pass the sound insulation tests required before handover of the development. Assistance can be given in the form of drawing analysis, meeting attendance, and in the case of dwellings formed by material change of use, we can inspect the building before work is started. This helps to ensure that the construction is capable of meeting the requirements of the Building Regulations and that money is not wasted on unnecessary or ineffective acoustic treatments. Why Are Sound Tests Needed? It is a requirement of Part E of The Building Regulations 2003 that all converted and new build residential developments with party walls or floors separating properties should be subject to sound insulation tests. Usually Building Control will want to see a report confirming a pass result by an accredited test company before the properties can be handed over. Compulsory testing was introduced to ensure that all new and converted residential properties meet the requirements of Approved Document E. As a result, the quality of the sound insulation of UK housing stock has improved in the last decade. 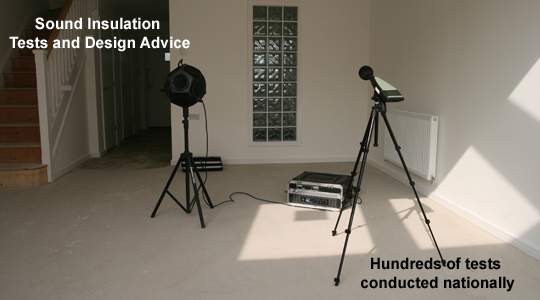 How Many Sound Insulation Tests Are Needed? Houses, flats and rooms for residential purposes are divided into groups depending on the construction of their separating walls and floors. The usual requirement is that one set of tests are performed on separating walls and floors per ten dwellings or flats in each group at the site. The tests are performed using the latest Bruel and Kjaer Building Acoustics Kit consisting of type 2260D ‘Investigator’ precision sound level meter, type 4296 OmniPower Sound Source and type 3207 Tapping Machine. The tests involve the generation of high levels of airborne and impact sound and the measurement and analysis of how much of the sound is transmitted between dwellings. The tests are entirely objective so the end result is a numerical quantity that either passes or fails the minimum requirements set out in the Building Regulations. The properties to be tested need to be structurally complete including windows & trickle vents, interior doors and working 240v mains electricity. For a copy of our site checklist which may be of assistance in determining when properties are ready for testing, download here our Site Readiness Questionnaire (pdf file). We attempt to keep site disruption to a minimum but it is likely that any noisy activity (hammering, sawing, JCBs etc) in close proximity to the test rooms will need to be stopped for a short time. Each set of tests takes approximately one and a half to two hours to complete. Provisional results are available verbally on site immediately after the tests are completed and formal paperwork follows by email usually within 1-2 weeks of the site visit. The results will be presented in a written report with the accompanying on line validation issued by the Association of Noise Consultants. If a failure result is obtained on site, we will work with you to find a suitable remedial solution. Sometimes the reasons for a fail result can be ascertained on site straight after the sound insulation tests have been conducted and advice given immediately on remedial solutions. If this is the case, no extra charge is made for this advice. There are instances when the reasons for failure are complex and significant investigative work or drawing and building analysis may be needed. In this case we are happy to provide a competitive quotation for the work.